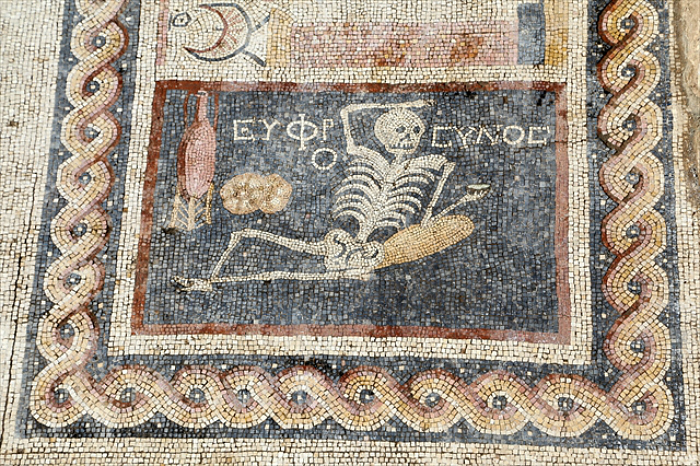 Reclining by a wine jug and a portion of bread, a cup in one bony hand, the skeleton on a 3rd-century BCE mosaic discovered in Turkey has a simple message for its viewers: “Be cheerful, enjoy your life.” The words in ancient Greek frame its skull and were revealed in a recent excavation in the ancient city of Antioch, located near today’s Syrian border. 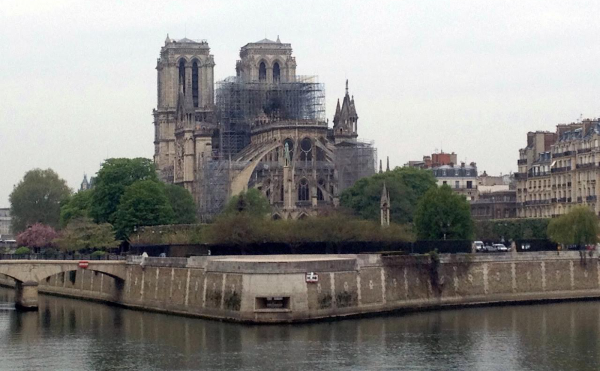 According to Turkey’s state-run Anadolu Agency, the mosaic was found in 2012, but was shared by the agency last week. The Daily Sabah reports that excavations were launched in the area when construction began on a new cable car. 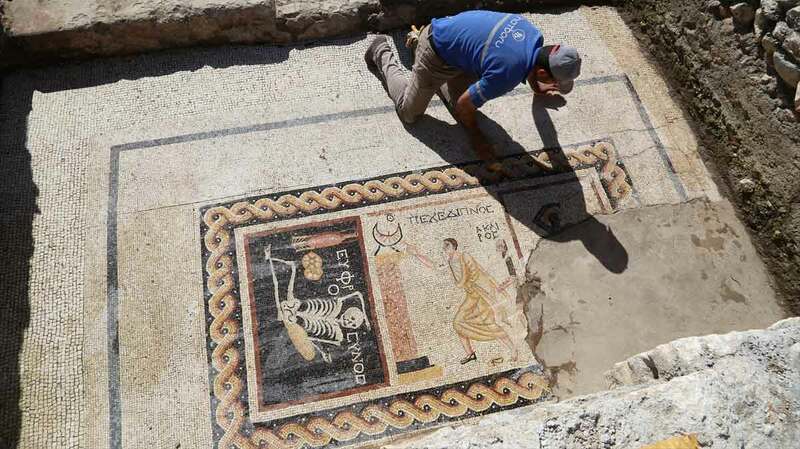 The bacchanalian skeleton is part of a group of mosaics discovered on what’s believed to be a dining room floor. One directly beside the skeleton shows a man racing towards a sundial, another reminder of the passage of time. It’s also not the only ancient mosaic to contain a corpse in the carpe diem spirit. Another similarly lounging but oddly fleshy skeleton was found along Rome’s Via Appia and is now part of the Museo Nazionale Romano. And two separate mosaics discovered at Pompeii feature, respectively, a skeleton standing with two wine pitchers and a skull balancing on a wheel between symbols of wealth and poverty, suggesting that death is the “great leveler.” While they might appear grim, their meaning was much more about celebrating life in the face of death than pondering that shared mortal fate. Hurriyet Daily News, which initially reported the previous translation, also followed up with additional opinions from experts, reporting that some believe the mosaic was initially “wrongly interpreted.” Historian İlber Ortaylı also told the publication that a “new, separate museum” should be set up for the mosaic area, and hopefully further research and the international attention for the mosaic will reveal more about its unusual design.